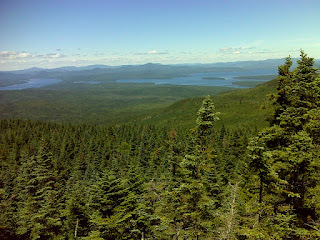 The view of Mount Washington and the Presidential Range, with Baldpate and Old Speck closer by, taken from Old Blue. 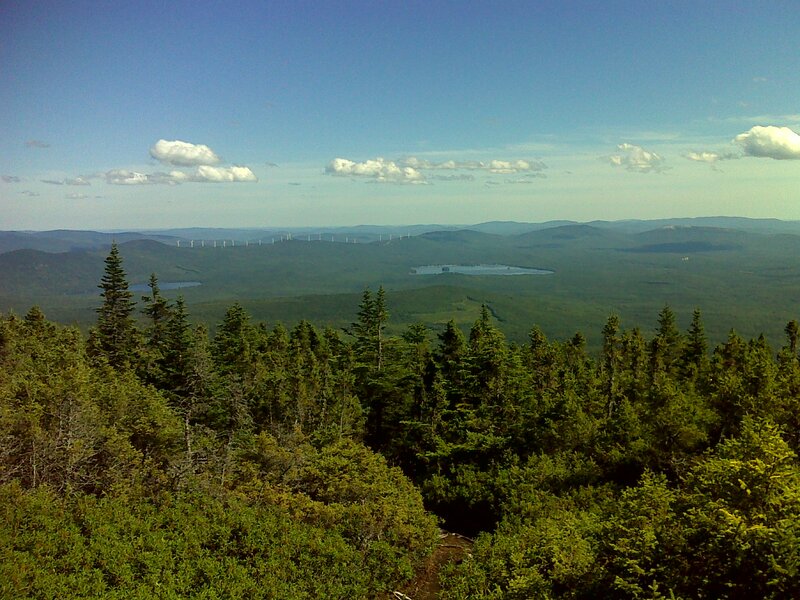 Also from Old Blue, the view of Ellis Pond and Little Ellis (left) with the wind turbine farm behind. I was on the trail at 6:45AM. I hiked north, making an immediate steep climb of about 700 feet up the side of Black Brook Notch to a very nice viewpoint at the top of the cliff. Then the trail slope lessens and eventually levels out for about a mile with one surprisingly tough little descent thrown in before it begins the climb up Old Blue. That’s not so steep as to be grueling but it is strenuous. Footing is sometimes an issue but overall it wasn’t a bad climb. At the top there are a couple spots where the trees are so low that you have good views off to the south. 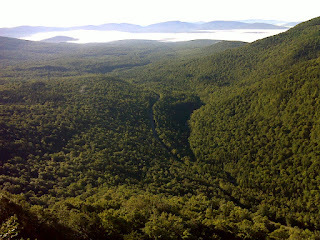 It was a spectacularly clear day, with visibility listed at 130 miles at Mt. Washington, though that seems conservative and I have yet to see any bigger number posted by them. 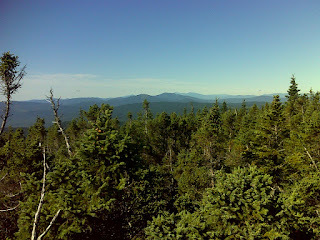 But from Old Blue, the Presidential Range was very clear. The descent down the other side is even easier, though still steep – but it’s a short descent to a 3000 foot elevation saddle between Old Blue and Elephant Mountain. The trail crosses the boggy saddle then skirts Elephant Mountain, climbing just 300 feet to a nice view point with a new little bench – the wood still fresh ‘yellow’ in color. From there it’s a small descent to a small stream then an equally small climb through some boulders to the plateau where the Bemis Stream Trail comes in. The AT continues along this plateau for more than half a mile and then ascends Bemis Mountain on steep, occasionally mildly difficult trail. 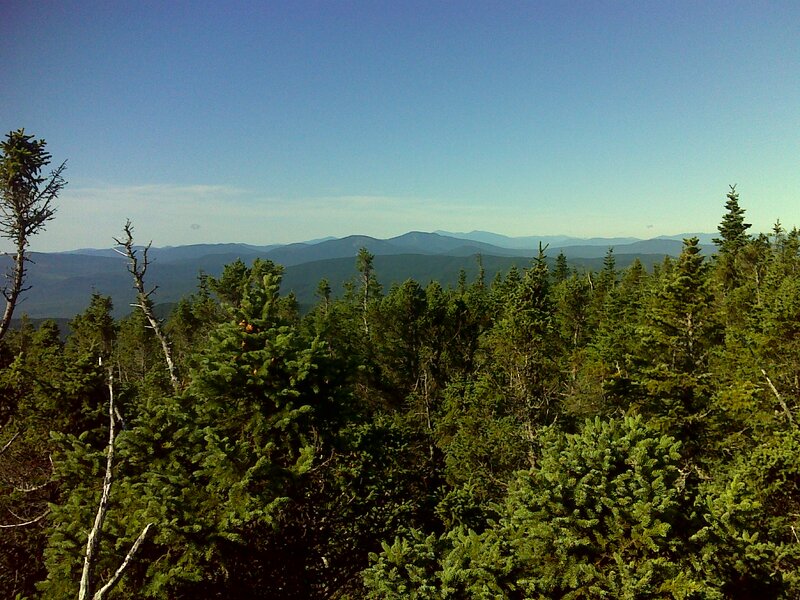 The summit of Bemis is wooded and offers no views. 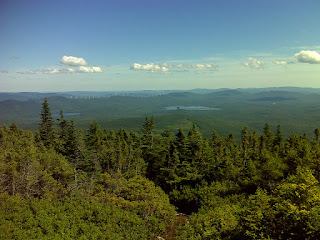 That was unexpected because the trail description posted by the Maine AT club at the road crossing at South Arm Road described the 'open exposed Bemis Ridge with many views'. Apparently that’s all on the north side on the secondary peaks that I’ll do tomorrow. 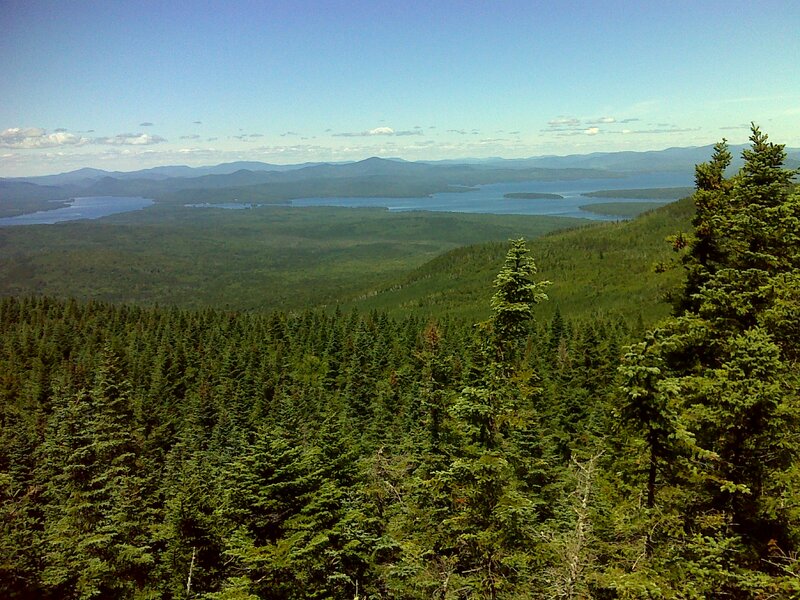 I had time to hike farther before turning around, so made it another 0.6 miles to a very satisfying viewpoint looking north to Upper Randolph and Mooselookmeguntic Lakes, gleaming sky-blue on this beautiful day. I would have turned around not 100 feet before this wooded turn-out vista point if it had not been for a hiker passing by where I had stopped and set a waypoint and got out my can of soda. He talked with me briefly and then headed on down the trail, still in sight when I heard him whistle ‘whew!’, indicating something especially notable. He disappeared to the side and then returned to the trail a minute later and hiked on. Obviously I had to investigate - and there was that lookout point, notable indeed. It was the perfect turn-around landmark – a great viewpoint that I can return to tomorrow and see under different weather conditions – and I almost missed it! The return trip went more quickly, as always. I passed a number of hikers who I’ll probably see again tomorrow, and got back to South Arm road at 5:30 feeling very exhausted, though I recovered pretty quickly after a half liter of milk and a bit of rest. Photos are melt-worthy. Love love love the views and the fact you don't have much humidity. So thankful for that. You deserve a little "nature's kindness" shown. :D Our hearts still travel with you, PJ.